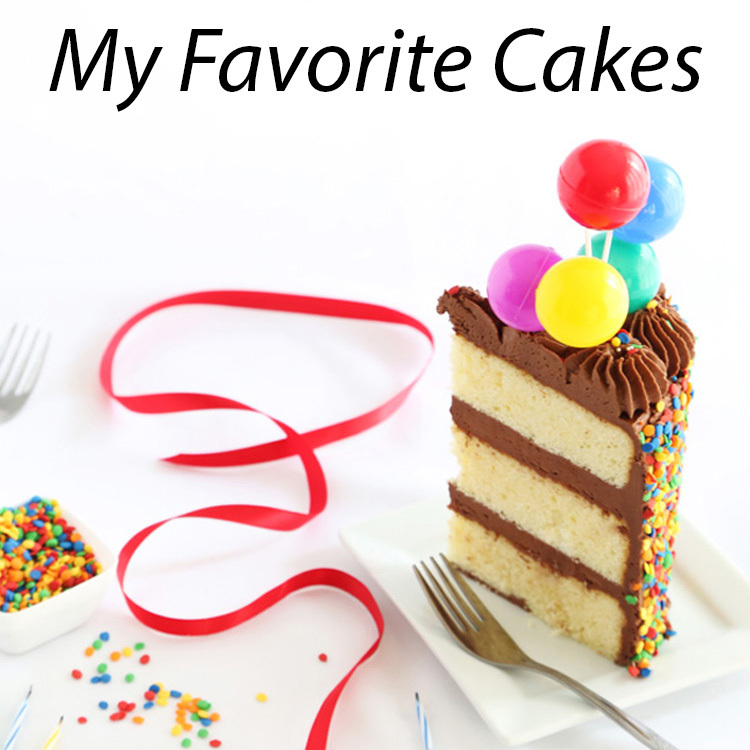 January is shaping up to be the unintentional month of cakes on this blog. I have an overstuffed binder filled with all manner of confections, but they'll just have to wait. Lately I've been seeking comfort in familiar things, which includes no small amount of floured cake pans. Add to that, hours of hiding behind Jane Austen novels and beautiful art books, especially those of papercut artists. I suppose this cake is my interpration of those three favorite things altogether. 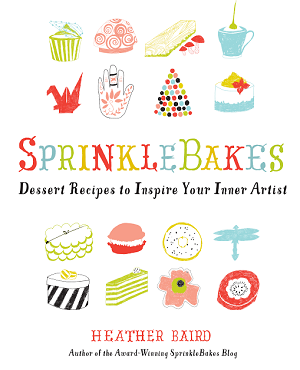 I've always loved using wafer paper in my baking craft (those of you who own my first book may already know this!). For those unfamiliar with the product, it is paper-like sheets made of food starch, usually rice, wheat or potato starch. It's mostly tasteless, and when applied to a freshly frosted cake, the paper perfectly melds with the frosting. If you've ever had authentic German lebkuchen, then you may have already tasted wafer paper because they are baked on oblaten, which are rounds of 'paper' made of the same type of food starch. The decor for this cake could not be easier to make. 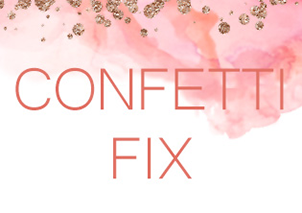 You'll need a decorative border punch and a large double punch for die-cut shapes. The embroidery border punch I used can be found here, and the large embroidery flower punch can be found here. These punches are extremely precise and sharp. Each stamp I made was perfectly cut. 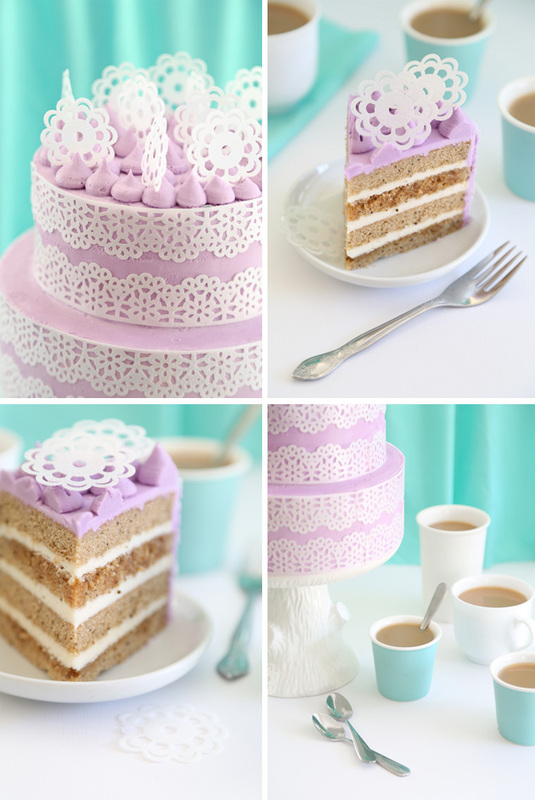 You can choose other styles of punches, but I wanted this cake to have a doily lace appearance, which I think makes for a nice tea-time theme with the Earl Grey cake flavor. You'll also need sheets of wafer paper. You can find a small supply here or a larger purchase here. 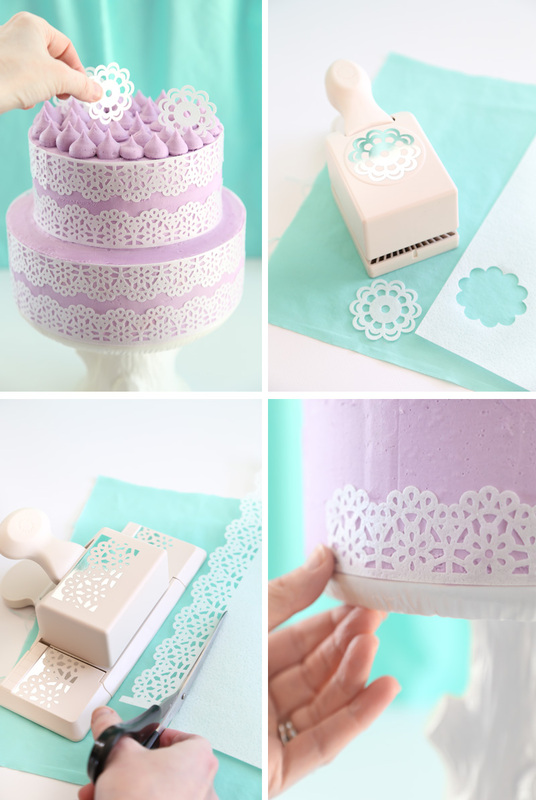 To make the die-cut doilies, just insert a fresh sheet of wafer paper into the punch and stamp out shapes. One 8x11 sheet will make several wafer doilies. To make the decorative edging, place the long edge of a piece of wafer paper into the punch and, following the line-up guide on the punch, stamp out the pieces. When you're done, cut the edging from the paper with a pair of scissors, and cut away the excess wafer paper on each short end of the decorative edging. Repeat the process until you have enough edging to wrap around your cakes. I used less than 5 sheets of wafer paper to make this cake. Here are a few things to keep in mind when using wafer paper on cakes. Use wafer paper on high butter ratio frostings. This includes American buttercream and Swiss meringue buttercream. You can find my recipes for those at the bottom of this post. Wafer paper will become brittle if left uncovered. Keep your sheets in gallon sized zip top bags, or cover them in plastic wrap while you work. Excessive moisture will cause wafer paper to dissolve or curl. Don't allow the paper come into contact with water. Wafer paper is best applied to a freshly frosted cake. This means the frosting should still be tacky. If the wafer paper will not stick easily or peels away, then your icing was too dry. Apply a dab of fresh icing under the wafer paper so it will adhere. In a pinch, a small amount of corn syrup can be used to tack down an edge, but use it sparingly. Since excessive moisture is the enemy of wafer paper, use it on cakes that do not require refrigeration. 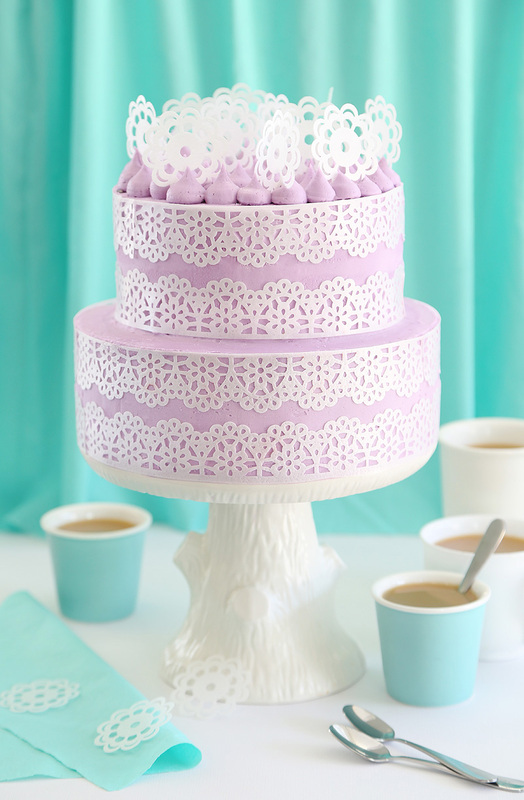 Cakes that are filled with lemon curd, fruit or pastry cream are not good candidates for wafer paper decor. This cake has many layers of Earl Grey tea flavor. The first is from tea-infused milk (hence the au lait), the second is a dose of finely ground tea in the cake batter, and the third is from tea-infused simple syrup. Some Earl Grey teas are rather delicate, and it can be difficult to coax the flavor out of those leaves and into a baked product. I like using Republic of Tea's blend called Earl Greyer. It is strongly aromatic and contains pure bergamot oil. I prefer it over any other brand specifically for baked goods because of its robust flavor. It's been a while since I've made a double tiered cake, and I'd forgotten how much I enjoyed it. If you're looking to make a smaller version of this cake, then the recipe can be halved and baked in three 8-inch layers. I've really enjoyed eating this cake, too. It's lovely inside and out. I'd suggest making the cake a day ahead of time because the tea flavor was noticably more intense the second day. If you're having a formal tea or bridal shower, then this may be just the sweet thing for your menu. It's also a good accompaniment for those bookish days when your heart aches for Pemberley. Following is a list of quick links to the materials I used for this project. The paper punches are not costly to purchase online, but if you are in the US, then it's likely that your local craft store will offer '40-50% off one regular priced item' printable coupons online (specifically Michael's and JoAnn). These coupons would greatly reduce the cost of the paper punches, and I plan to collect one or two for that purpose. This two tier cake requires 8-inch cake pans and 6-inch cake pans (one of each, with pan washing and prep between baking layers). 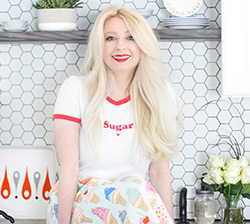 For a smaller serving size, the cake recipe may be halved and made in three 8-inch cake pans. I recommend using The Republic of Tea’s special blend of Earl Grey tea called Earl Greyer. It’s stronger than regular Earl Grey because pure bergamot oil is added to the leaves. It’s available at specialty stores and at some grocery stores. See blog post for product links. Preheat oven to 350 degrees. Prepare two 6-inch cake pans with flour based baking spray (I like Baker’s Joy). Prepare two 8-inch pans with baking spray. Set aside. Make the infused milk: Place the milk in a medium saucepan over medium heat. Gently heat the milk until steaming but not boiling, and add in the 3 tablespoons loose tea or 6 tea bags. Remove from the heat and continue to steep until the milk has cooled, about 20 minutes (this step can be done a day ahead of time). The infused mixture should be milky tan (like a latte) in color. Strain the Earl Grey au Lait through a fine sieve or cheesecloth if you used the loose leaf tea, or remove the tea sachets and squeeze the excess milk from them into the saucepan before discarding them. Make the simple syrup: Bring the sugar and water to a boil in a medium saucepan over medium-high heat. Reduce the heat and bring mixture to a simmer. Add in the tea and continue to cook the syrup for about 10 minutes. Remove from heat and let steep until cool. Strain the tea from the syrup using cheesecloth, or remove the tea bags and discard them. Make the cake layers: Sift together the flour, baking powder, salt, and ground tea into a large bowl. Whisk briefly until combined. Add the butter and sugar to the bowl of an electric mixer; mix until combined. Add vanilla; add eggs and yolks one at a time, mixing well with each addition. Add the flour and infused milk alternately, beginning and ending with the flour mixture. Stop the mixer and scrape down the bowl. Do not over mix. Evenly distribute batter between the cake pans. Apply Bake Even Strips to the cake pans if you have them. Bake for about 20-24 minutes, or until a toothpick tester comes out clean. Cool on a wire rack 5 minutes before removing cakes from their pans. Make the frosting: Cream the butter in an electric mixer using the whip attachment. Add confectioners’ sugar and mix on low until the mixture becomes crumbly, about 5 minutes. Add the vanilla extract and bergamot or orange extract. Add cream or milk a little at a time with the mixer on medium speed, until the mixture is thinned to spreading consistency. Whip on high speed until fluffy. Remove 3 1/2 cups of the frosting and place it in a separate bowl; cover with a damp towel to prevent drying. Add food color to the remaining frosting and mix again. Scrape the bowl down and turn the frosting over to make sure the color is fully incorporated. Beat again until the frosting is consistently purple in color. Torte each cake layer with a cake leveler or serrated knife so that you have four layers of each size cake (four 8-inch, four 6-inch). 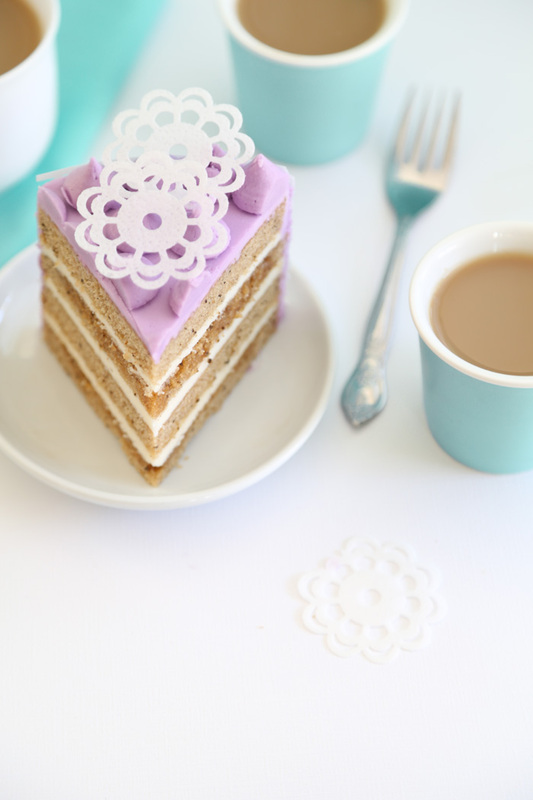 Choose a cake stand or serving plate and place one 8-inch layer on it; generously brush or spoon on the Earl Grey simple syrup; top with 2/3 cup white frosting. Add a second layer and repeat the process twice more. Top cake with the final 8-inch cake layer; brush with simple syrup but do not frost; refrigerate. Repeat this process to build the 6-inch cakes on the cardboard cake circle, except fill the cakes with 1/2 cup of white frosting instead of 2/3 cup. 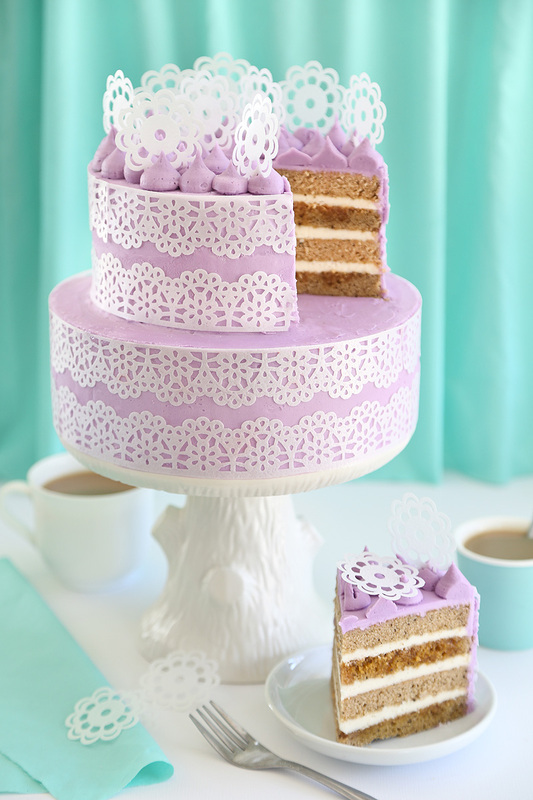 Cover both cakes with a thin crumb coat of purple frosting and refrigerate until solid, about 15 minutes. Have the wafer paper decors ready to hand (place them in a zip-top bag to prevent drying). Cover the 8-inch cake with a final layer of buttercream, it doesn’t have to be perfect but try to make the frosting as smooth as possible. Immediately after frosting, and while the frosting is still tacky, apply the wafer paper embroidery edging strips to the bottom edge and top edge of the cake (see pictures for orientation). Line the strips end to end, and snip away excess with kitchen scissors. Frost the 6-inch cake in the same manner, applying the wafer paper embroidery strips. Transfer excess frosting to a piping bag with a 1/2 inch plain decorator tip. Measure a wooden dowel to size, and insert it into the center of the 8 inch tier for support (this isn’t a heavy cake so it’s not absolutely necessary, but I’d recommend it if you are transporting the cake in a vehicle). Use a long offset spatula to slice the 6-inch cake onto the center of the 8-inch cake. Pipe frosting ‘kisses’ on top of the 8 inch cake, and arrange the embroidery flowers standing upright in the frosting. Serve immediately, or if patience allows cover loosely in plastic wrap and allow the flavors to marry overnight before enjoying. I love love using wafer paper! If you have an edible printer or edible airbrush paint, you can color it, too! I painted some wafer paper with gold edible airbush paint, let it dry and then punched out a bunch of stars for some Advent cupcakes. Well that makes lace so much easier! This cake is beautiful Heather. I love Earl Grey and I love the strict layers you have going on here. I bought a whole stack of wafer paper because of one of your posts..I was happy to...but thoght..now what? :)Thank you for this extra way of using it!! I just wanted to say a massive thanks for bringing back the metric weights. It really is so much better. A decorating technique even I can do! (Hate messing with fondant.) Plus I have all the equipment needed. And I've been dying to make something featuring the Bergamot oil flavor. Question: I have on hand food grade Bergamot essential oil. Any suggestions on how to substitute that for the Earl Grey tea, or would tea be best? Exquisite, as always, Heather. Thank you for sharing your creativity so generously with us, this is an absolute stunner. Oh man, I want this for my birthday! Earl Grey is my absolute favourite! I love it with lavender, which I think would be an amazing addition to this. 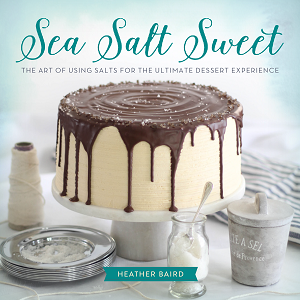 Swap out the bergamot extract for lavender in the frosting and I bet it would be amazing. Strawberry is another flavour that plays well with Earl Grey; I'd love to make this with strawberry curd filling. 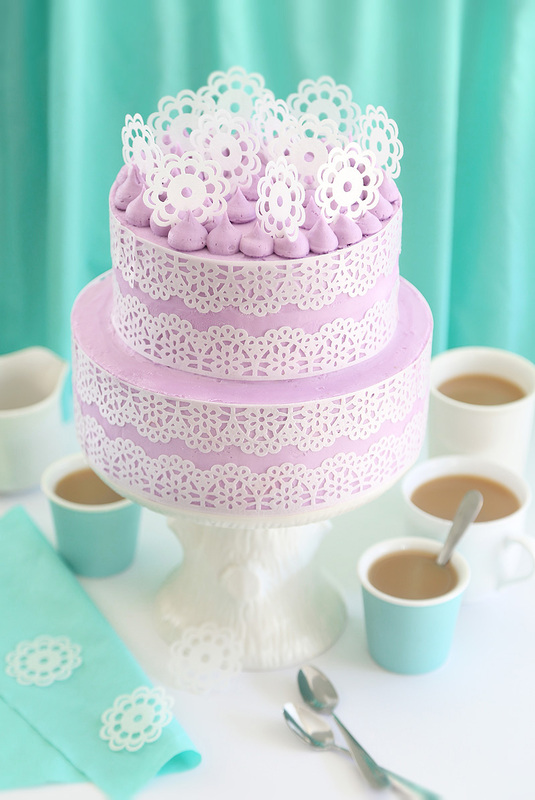 Love this cake, the colour is so pretty! This is gorgeous, and I can't wait to try it. I want to make it for a show I'm working on, but we have some gluten-free folks. Any suggestions on the best way to swap in a gluten-free flour? Or the best substitution? Hi! I wish I had more experience with gluten-free baking (I'm taking a class on this in March, so stay tuned!). Right now the only advice I can give is substitute regular flour with a 1 to 1 flour. I've used Bob's Red Mill brand 1 to 1 baking flour in cakes with success. Thanks for your question - best of luck!